Land trusts are abundant in our state preserving properties of all sizes from development. There are over 137 organizations that serve to protect natural resources by secure hiking and recreation, ecological buffer zones, and open spaces. Land trusts are mostly non-profit and community based, seeking to preserve the forests, river corridors, farmland, watersheds, parklands, marshes, scenic vistas, and hiking trails in a given town or region. Land Trust are also largely volunteer operated and are a great way to get involved in your area. Currently only the largest and regional land trusts are listed here. 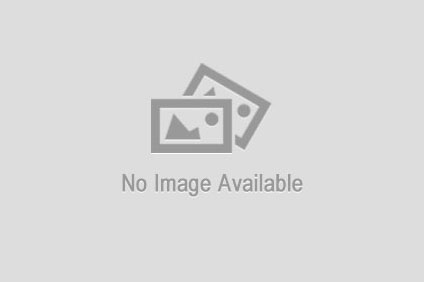 As this site continues to develop I hope this page will provide a more polished and complete representation of Connecticut’s land trusts. This is a partial/incomplete page as I have not yet explored the Hoffman Preserve. This is a partial/incomplete page as I have not yet explored the Lombardi Ridge Preserve. The trails of the Allanach-Wolf Woodlands are one of the great Joshua’s Trust properties. Heading left from the main parking area passes through pollinator and native plants garden that flowers beautifully in the spring. There is a bench above a short slope to the water with a view of Lake Marie. Following the curved trail over the paved driveway winds through a hemlock grove. Crossing over the pavement again heads down among the pines to a small peninsula where a table serves as a great picnic spot. The paved driveway and the garage at the end are some of the obvious reminders of Ada Wolf’s ownership. The turnaround below the garage provides yet another view of the water. Lake Marie is a shallow 22-acre pond that prohibits both boating and fishing. Active beavers can be seen throughout the year. In early winter I watched from the lean-to at the north end of the lake as a beaver ambled down the bank before slipping under the ice and swimming off. In the summer you can see their trails through lily pads and algae that cover the water. The northern section of the property is trailed by the .6 mile yellow trail an old out-and-back cart path. The Joshua’s trust website mentions the possibility of a greenway in this area and there is evidence of roughly another mile of unblazed trail that leaves the property (likely private property without an easement at this time). There are also the faint remainders of other paths branching off into the woods which I have explored over the years. I certainly hope the Woodlands trail system expands as it is one of the great Joshua’s Trust properties. From the views along Lake Marie, hiking along Ballymahack Brook, and peaceful settings throughout I’ve found reason to revisit this place time and again. In July of 2018, Congressman Chris Murphy held a “Congress on Your Hike” to talk with local residents at the Woodlands and to respond to issues. Preserved in 2009 when it was donated by Ada Wolf. This is a partial/incomplete page as I have not yet explored the Edith Toomey Clark Preserve. This is a partial/incomplete page as I have not yet explored the Mica Ledges Trail. 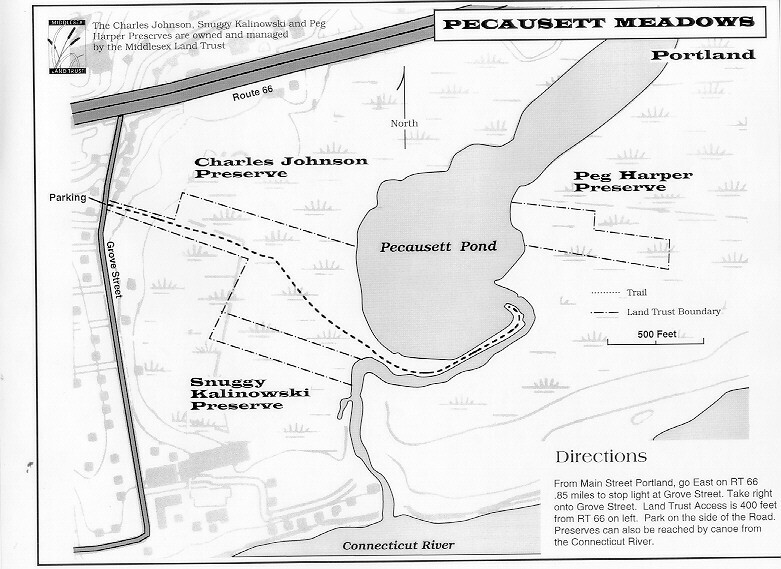 This is a partial/incomplete page as I have not yet explored Pecausett Meadows. 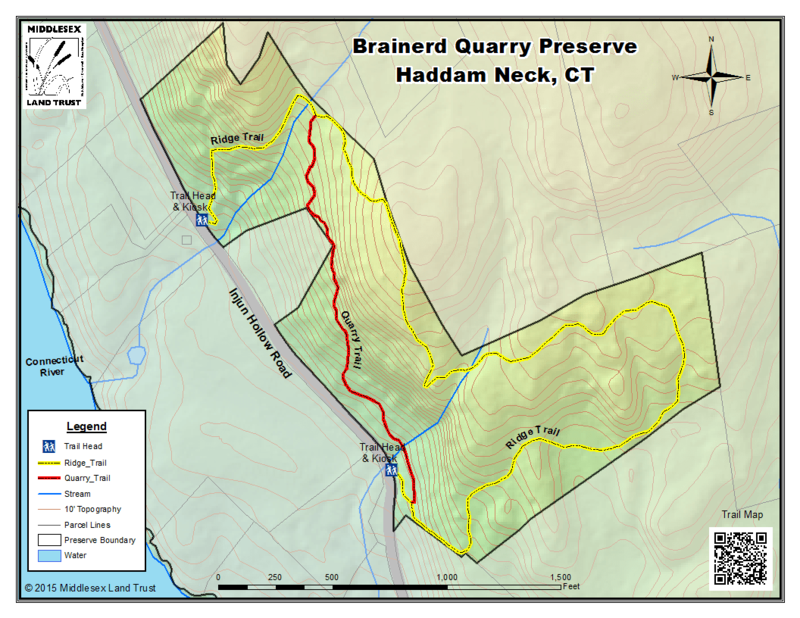 This is a partial/incomplete page as I have yet explored the Brainerd Quarry Preserve. Part of the original Fanning/ Eccleston Farm, founded in 1705, it ranged from the top of Fort Hill to the common lands of Noank, a few miles away, and included up to 200 acres. The original 1732 farmhouse and fields still exist on 6 acres of land adjacent to the Merritt property. The Francis E. Merritt family acquired the property in 1868. Fort Hill was the site of the fortified village of Chief Sassacus, later occupied by Robin Cassasinamon and his tribe in 1669. There is one known colonial archeological site on the property and four Native American campsites in close proximity as documented by Nicholas Bellantoni, State Archeologist.